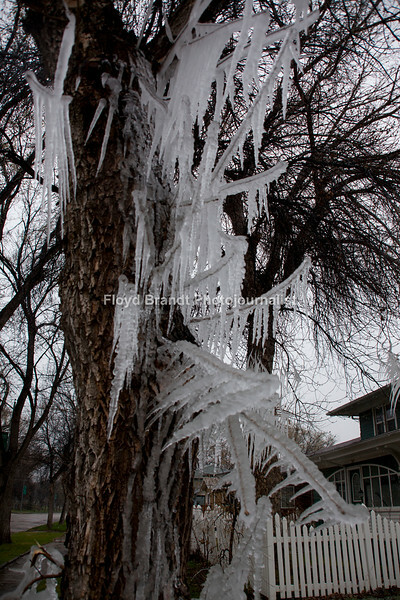 Havre Daily News/Floyd BrandtHavre residents thought winter had returned with large icicles hanging from the trees at 929 3rd Avenue Monday. What looked like a magical ice sculpture was just a mistake by resident Jake French. French said he forgot to turn the sprinklers off Sunday night and when he left for class in the morning he found what left Havre residents scratching their heads, wondering why there was only this much ice in French's yard. French said that social media lit up with discussion about his yard and people had been driving by, stopping to take pictures and that some were driving around the block to take a second look.